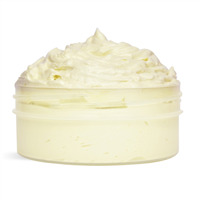 Lavender and chamomile add to the calming whipped body butter made from this body butter making project. 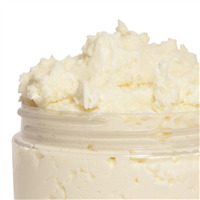 Create this body butter with natural ingredients! This recipe calls for chamomile butter, evening primrose oil, tapioca starch, vitamin E, and lavandin essential oil. Lavandin is similar to lavender, but with a slightly stronger aroma. 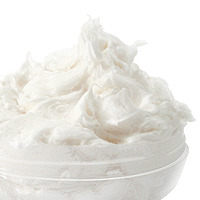 Finish the project by packaging the whipped body butter into classic plastic jars, and twisting on the tops. If selling these, you'll also want to add a label. You Save $12.05 by purchasing this kit rather than buying the items separately. Chamomile Butter, Evening Primrose, Tapioca Starch, Lavandin Essential, Vitamin E.
COMMENTS: We were looking for a gift for clients that was practical and pampering. This was the first kit we've purchased and we took a chance on buying more than one. It made up beautifully! Everything was well packaged, marked, and easy directions to follow. We used 2 ounce containers rather than the 4 ounce. We had no trouble finding a use for the containers that came with the kit. 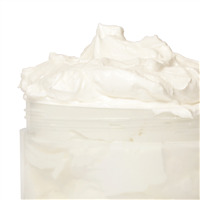 Initially, we were concerned the body butter may be too "greasy" when applied, but it absorbs nicely. We're now huge fans of the Lavandin EO. Best yet - the clients loved it! "Do you recommend a preservative with this? 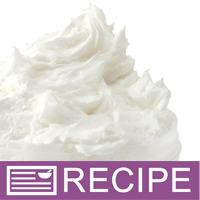 What is the best way to use a preservative in a whipped product so it doesn't go flat?" Staff Answer When asked, we recommend the Germaben II E preservative for this product.